...globally looks to be returning to the upside as OPEC, Russia and other countries will contemplate adjustments at their next meeting on June 22nd. The signatories to the cutbacks that began in 2017 have succeeded in eliminating “excess” global inventories. 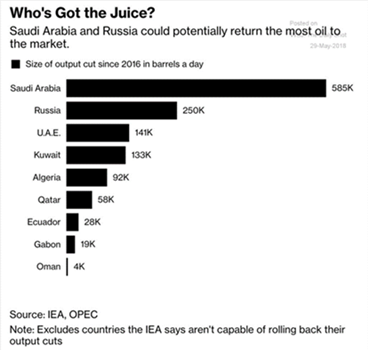 Not only has economic mismanagement hit Venezuelan (and to a lesser extent Mexican and Angolan) production and internal strife hampered Libyan and Nigerian output, but Saudi Arabia cut further than its goal, undoubtedly to support prices before its Aramco IPO (currently pushed off to 2019 per the Saudi oil minister). Price spikes in May over the Venezuelan election farce and Trump’s decision to start the clock on re-imposing sanctions against Iran (effective November 5th) led to concerns over supplies, particularly to energy-hungry China and India. With OPEC’s global inventory go als reached and the threat of instability in the oil markets, Saudi Arabia and Russia (the top oil exporters) met in May and indicated their interest in an increase. The question now at the June meeting is by how much. Per Bloomberg, the producers are debating whether to offset all the excess cuts made involuntarily in nations like Venezuela, or simply requiring individual members to move back in line with their own targets, which would entail a smaller boost. The lower end of the potential increase, backed by Gulf producers including Saudi Arabia, would add just 300,000 barrels a day (bpd) to the market. The more generous option favored by Russia would deliver an additional 700,000 to 800,000 bpd. This additional flow could start as soon as Q3 but will take a few months to get more than 200,000 bpd, as we estimate as only Russia and Saudi Arabia have ready capacity (though some other members have room to eventually contribute – see right). Maduro handily won the Venezuelan presidential election, after which he released a number of political prisoners (helps to have the opposition in jail!). The country is about $1 billion behind of debt payments just from the end of last year, let alone from 2018. ConocoPhillips won a court case against the country’s national oil company (PDVSA) and has moved to take over $636 million of assets in the Caribbean as payment for $2 billion of assets seized by Venezuela a decade ago. The assets Conoco is targeting play a key role in processing, storing and blending oil and products for export to the US, China and India, which would further cripple the Venezuelan economy. PDVSA refineries are operating at 28.8% capacity, the lowest rates since October as lack of maintenance and quality crude oil limit their use. No relief is expected any time soon as ten crude oil tankers remain anchored at Caribbean ports awaiting payment from PDVSA. 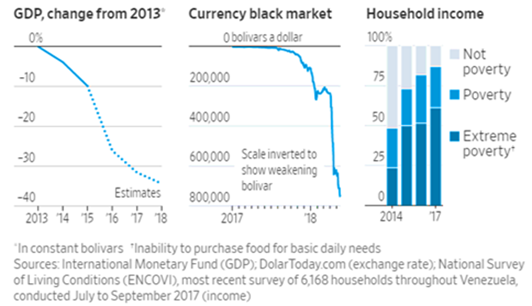 The WSJ graphic to the left sums up succinctly the economic damage wrought by Chavez and Maduro. Finally, Venezuela reported that it can only make about half of its promised oil shipments, affecting Chinese, American and Russian buyers. Not good. Trump’s decision to pull out of the Iran oil sanction-relief deal has Europe scrambling to decide whether to defy the US decision or not. Essentially, firms must choose whether to do business in Iran or the US, threatening those European companies that eagerly ramped up exports to and investments in that country. Waivers are possible as Europe, South Korea and China are all large importers of Iranian oil and are negotiating with Trump on other trade issues (e.g., steel, grains, intellectual property). However, more volatility is likely before this situation normalizes. Finally, Iraq has signed an agreement with British Petroleum which would triple the oil production from the Kirkuk oil fields in northern Iraq to more than 1 mbpd – this production will have to go somewhere! ...continued higher to 10.8 mbpd, supported by a substantial rise in the oil-drilling rig count from 825 rigs on April 27th to 861 on June 1st, an impressive 5% increase. 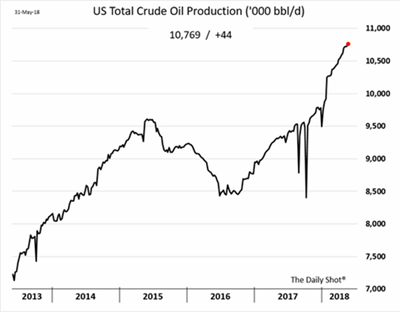 US shale production is expected to rise by about 145,000 bpd to a record 7.18 million in June. US crude oil exports continued their high pace, with expectations of 2.3 mbpd in June. 1.3 mbpd is off to Asia (including South Korea, Singapore, Indonesia, Malaysia and China), displacing Russian and OPEC exports. The real constraint that the US faces is not production but pipeline and export terminal capacity – can all the oil (and gasoline) actually leave the country to eager customers? Trucking and railroad alternatives are already running at maximum rates. New pipelines are due to come on line in mid-2019 but with Canada also pushing oil output through the US network, there are bottlenecks. In Canada, President Trudeau’s government agreed to buy an under-construction pipeline that is opposed by the provincial government of British Columbia as well as native and environmental groups. Wheth er Ottawa will be successful in completing this pipeline to make their oil available directly to Asia and not be trapped to going through the US is an open question. Which will win: economic growth or environmental concerns? …increased 9.3% year-on-year in April as refining runs increased to over 12 mbpd. China overtook the U.S. as the world’s largest oil importer last year, and it should increase that difference in 2018. China’s domestic oilfields are struggling to keep up with demand as wells get tapped out and the government pushes the big three state-owned firms to instead produce more natural gas. As a result, the country is leaning more heavily on oil imports. “Petro-yuan” trading continued to increase, though the market is still relatively small. In negative news, the energy firm CEFC defaulted on $313 million of bonds, tainting the rest of its $4.3 billion of debt and ending an agreed-upon deal to buy a $9 billion stake in the Russian mega-energy firm Rosneft. Highly embarrassing for Sino-Russian relations. …suffered through a ten-day transportation strike in May which shut down multiple industries and exports. Truckers protested fuel costs which had increased by 38% in April alone by parking their rigs in 600 locations across the country’s highways, causing commerce to collapse. Some examples: 107 of 109 meat processing plants stopped exporting beef, the ports were emptied of soybeans and sugar during the critical harvest season and cars ran out of gasoline. Exacerbating the situation, many truckers refused to drive off after the government reduced fuel costs by 13% for 60 days, even stoning to death a trucker that tried to leave a picket line. In addition to the economic costs of the shutdown (estimated at -0.5% of GDP of impact just for those few days), the refunds to truckers are estimated to be about $1.6 billion this year. A harsh blow for the commodity powerhouse and with presidential elections in October, more chaos can be expected later this year. …included a strong showing by US farmers in terms of planting the summer crops of corn and soy – crop conditions were good as well. Rice, cotton and peanuts all are at expectations with wheat the laggard. Meanwhile, there was record high pork production in April and beef production was up 8% year-on-year, which is absorbed by exports to China, Japan, Korea and Mexico. Mexico by itself is 22% of US pork exports and is setting up Brazil and Canada to replace US supplies after imposing a 20% tariff on pork imports. Per the US Meat Export Federation, pork producers would lose $2.2 billion due to China demand declines and tariffs. China’s customs said that it had ramped up inspections of US pork, which would slow down imports. China’s crude steel production, accounting for half of the world’s supply, climbed to a record in April despite capacity cuts. The state of negotiations is in flux with Chinese offers to buy more coal supposedly made as well as US threats of additional tariffs. NAFTA negotiations also are going back and forth with sharp words exchanged between Trump and Trudeau while Mexico just applied tariffs. Will all parties walk away in a huff or will someone blink? On Yaji Mountain in southern China, they are stacking the sows a thousand head per floor in high-rise “hog hotels.” Privately owned agricultural company Guangxi Yangxiang Co Ltd is running two seven-floor sow breeding operations, and is putting up four more, including one with as many as 13 floors that will be the world’s tallest building of its kind. California is poised to become the first U.S. state to require solar panels on nearly all new homes. The California Energy Commission approved a requirement that residential buildings up to three stories high, including single-family homes and condos, be built with solar installations starting in 2020. It estimates that the mandate, along with other energy-efficiency measures being added, would add $9,500 to the average cost of building a home. Finally, Canada’s oldest — and only – agricultural commodity exchange is closing its doors as the Winnipeg Grain Exchange, established in 1887, will shut down for good after its owner transfers the bourse’s only remaining futures contract to New York in July.